Celiac disease in children is an autoimmune condition where the body is unable to tolerate a protein called gluten. This genetic condition tends to run in families, though it may have environmental causes as well. Koyel Jain, mother of a 4-year-old girl, Maya, was worried as her child would have diarrhea occasionally and poor weight gain. “Over time, my daughter’s height was visibly shorter and she wasn’t growing well. When she seemed paler and more irritable as days passed, I decided we needed to consult a pediatrician,” recalled Koyel. Maya was diagnosed with celiac disease by a simple blood test at her check-up and referred to Dr. Nidhi Rawal, Pediatric Gastroenterologist at Sitaram Bhartia Hospital, for more specialized care. “This condition begins slowly with the introduction of gluten in the diet and is often unsuspected for years. Timely celiac disease diagnosis and a gluten free diet can reverse the ill-effects that the child has been experiencing,” reassured Dr. Nidhi. Koyel was unsure as to what it meant for a child to live with celiac disease. Dr. Nidhi clarified her doubts to help her understand Maya’s condition. Gluten is a protein usually found in grains such as wheat, rye, and barley. When children dealing with this condition eat gluten, their body’s immune system attacks the small intestine and damages its ability to absorb nutrients including proteins and iron. Celiac disease affects children differently, according to their age. Wish to get your doubts regarding your child’s condition addressed? Avail a consultation with our Pediatric Gastroenterologist by filling in the form below! Koyel was relieved she reached out to the doctor in time before her daughter’s symptoms worsened. How Serious Is Celac Disease In Children? Koyel was concerned if Maya’s condition could result in any possible complications. Without proper management, the damage to their intestines can become life-threatening and lead to small intestine cancer. “But what can trigger celiac disease?” asked a worried Koyel. She wondered if there were any preventive measures she could have taken. “Celiac disease cannot be prevented as the condition is caused due to genetic as well as environmental reasons. Research is also being done to understand celiac disease causes better,” said Dr. Nidhi. There are no side effects of a gluten free diet and no medications are needed to treat celiac disease. Follow these easy tips – save this image or take a screenshot for your personal use! The first step to managing this condition is knowing what your child can or cannot eat. 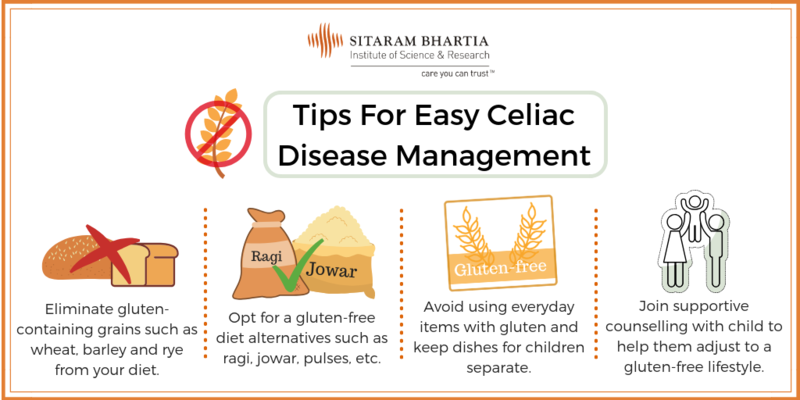 For a gluten free diet in India, eliminate cereal grains such as wheat, barley and rye from their diet and discuss the possible dietary alternatives with your Gastroenterologist. Eating gluten-free foods in a country where roti (made of wheat) is one of the essential food items consumed by the masses may seem difficult, but it is not. Your doctor can help with gluten-free alternatives to common food recipes, which will make sure that your child’s quality of life is not compromised. Keep dishes for children separate: Cooking dishes and appliances for children with celiac disease should be kept separate from the rest of the family members. This includes toasters, pans, pressure cookers, ovens etc. Read the labels for processed foods before eating: Many processed foods use gluten as an ingredient in them. Avoid accidentally introducing gluten to your child’s diet again by reading the labels before buying. Cosmetic products such as lipstick, lip balm, etc. Living with celiac disease can be a major lifestyle change for many and there can be challenging times for your child to stick to a strict diet. As Koyel came to understand that celiac disease in children is a lifelong condition, she realised that treatment included major changes in her daughter’s lifestyle. “I was worried in the beginning, but I started feeling more confident about establishing a gluten free diet in India for Maya after regular discussions with her doctor,” said Koyel at a follow-up consultation. Learn more about conditions treated under Pediatric Gastroenterology.